A basic FIV lentivector with a CMV promoter upstream of an MCS – SBI’s MCS1 - and marker-free for maximum flexibility. Well-regarded in the industry for high, reliable gene expression, SBI’s lentiviral vectors come in a variety of formats that support a wide range of applications. 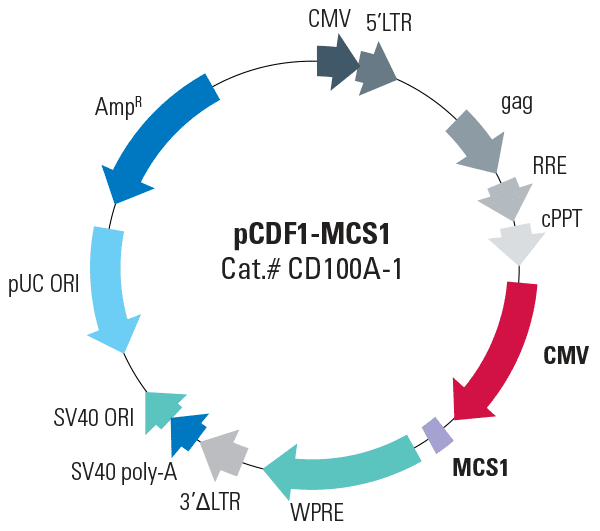 The pCDF1-MCS Cloning and Expression Lentivector is a great, streamlined FIV-based lentivector for when you don’t need a marker or reporter.